Marie immigrated to Victoria from Quebec City, a French-speaking city in Canada. After obtaining a master’s degree, Marie taught at a special school in Victoria for three years. She always has an easy-going smile and exudes confidence. Nine years ago, Marie experienced allergic skin rashes and body aches. Her strong personality forced her to try to smile, but she found life very hard. She continued, “I no longer worry about tension and anxiety. Now with two sons, my life is peaceful, calm, and I can enjoy being a full-time mother. The most important thing for me is that I have my faith and a destination for my soul. The first time the condition occurred, Marie was 16 years old, and it was the day before a major school test. After that, the problem kept occurring. The sudden onset could happen at a birthday party or concert. This made Marie feel embarrassed and depressed, which in turn worsened the condition. After finishing her third year at university, Marie returned to Canada to continue her studies and eventually obtained a master’s degree in allied health. Marie met her now-husband when studying in Australia, where she first found Falun Dafa. She recalled: “When just starting on my cultivation path, I saw the Chinese Communist Party’s (CCP) propaganda against Falun Dafa on the Internet. My family kept asking me, ‘Do you really want to learn this? Do you really believe this is good?’ I decided not to believe what I saw on the Internet but to concentrate on practicing the exercises and reading Zhuan Falun. “I used to think about how to make my life more comfortable. I thought that my husband should clean up after himself, my boss should pay me more, I should get subsidies on business trips, and so on. I am a perfectionist, so I hoped that my husband could become one too. But, after I began to cultivate, those thoughts disappeared from my mind. Since she no longer only thought about herself, Marie’s body and mind became more relaxed and peaceful. No matter how hard her work life, she no longer experienced the symptoms that caused her sudden pain. “My husband once mentioned to me, ‘You don’t seem to become ill anymore.’ I realised that my body had changed. I experienced this after I started reading Zhuan Falun in late 2010. “From then on, when my husband and our children come down with a bad cold, I don’t get it. I no longer need to sleep for a long time and am filled with energy. I get up and meditate in the morning. After the children are asleep at night, I can do all the housework. I no longer need to eat at specific times every day. “In the past, I often felt overwhelmed, but now I just remind myself not to worry, maintain a peaceful mind, and don’t worry about the results. I feel that I am showing my sons how to act calmly and with a smile in daily life. Sometimes I still feel stressed, but by looking inward and finding and letting go of attachments, I overcome it in no time. She said that the students at the school have different levels of mental disabilities, and many students have autism. When she first started to work at that school, someone told her that the former health professional had resigned because of pressure from the school’s teachers and parents. As the only therapist in the school, Marie had a heavy workload, dealing with children of preschool age to the 12th grade. She aimed to keep a positive attitude and help every student, ignoring any difficulty. Because Marie’s mother tongue is French, she speaks English with a bit of an accent. Some teachers didn’t have a good first impression of her and deliberately made things difficult, but Marie is a Dafa practitioner and didn’t retaliate. A few months later, her relationship with the teachers was very harmonious. Marie said: “When the principal assigns me the early shift, I don’t complain like my colleagues. Usually, we have to spend a lot of time preparing for the day’s work in the morning, so we have very little time to prepare if doing the early shift. I try to make a bad thing become a good thing and use this opportunity to learn more about the child.” This attitude helps her with each child she comes in contact with. An occupational therapist once said to Marie, “Your professionalism and professional ethics are very admirable.” The therapist later learned the Falun Dafa exercises. During school swimming classes, because of a shortage of teachers, the principal hoped that the staff of Marie’s department would go to the pool to help. 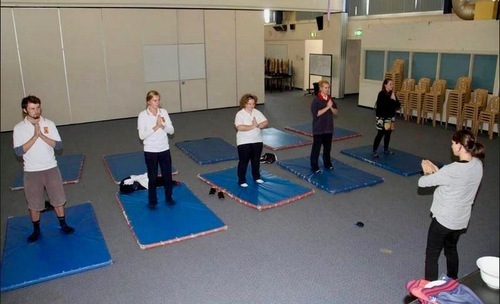 Marie holds an exercise class at the local middle school, where she introduces Falun Dafa to students. 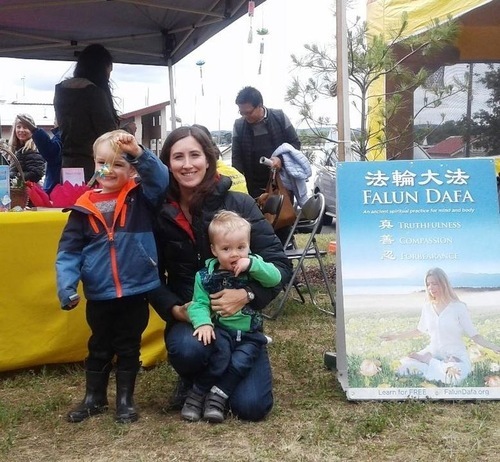 Whenever there is an opportunity, Marie will bring her own children to participate in activities organised by Falun Dafa practitioners. Every Thursday evening, Marie practices in the park near her home, helping local people learn more about Dafa. Marie’s home is in a quiet countryside town of Victoria. She shared her experience about Dafa and the physical and mental changes she experienced with the children of the local Secondary College VCE class. This benefited the children with whom she shared the five sets of exercises and the principles of Truthfulness, Compassion, Forbearance. She found that the practice helped the students feel comfortable and is effective in relieving stress. A story about Marie teaching the graduating class was published in the local newspaper. At the end of the class, children asked for details of the local Dafa practice site.